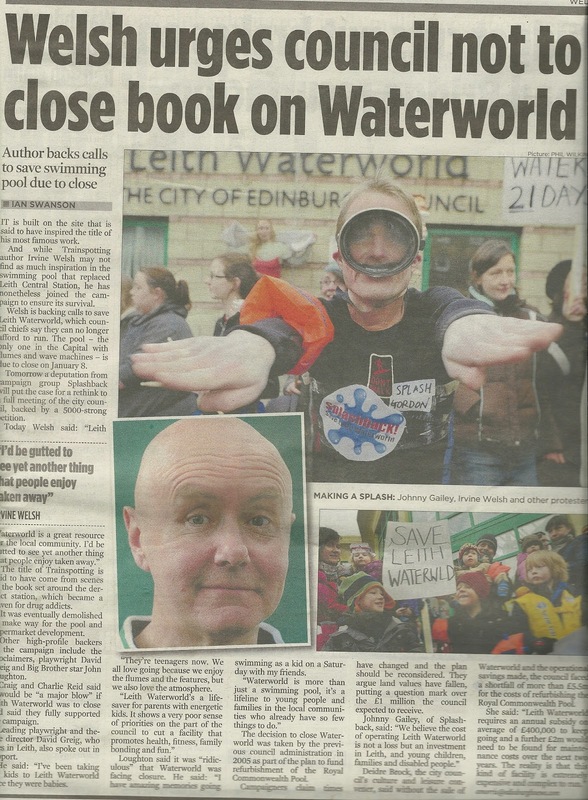 Splashback – Save Leith Waterworld: Don't pull the plug! The Splashback! campaign is tomorrow taking its case for a reprieve for the well-loved amenity to the full Council in the morning. Campaigners are arguing that the Council should stand by it's 2007 promise to keep the facility open until the Royal Commonwealth Pool is 'open to the public'. The delay would also allow the Council to wait to see results of the Equality Impact Assessment, which assesses whether certain users groups would be particularly hard hit by the proposed closure. As of yet, the EqIA has not been done by Edinburgh Leisure, despite being a requirement of the funding agreement between the two bodies. Splashback! believes that any decision on the future of the pool by the Councillors must be based on up-to-date information and furthermore believes that a meaningful assessment of the proposed closure will reveal the unfair impact that the decision to close would have on toddlers, children, , families, people with disabilities and people in Leith. Splashback! has been overwhelmed, but not surprised, by the support the campaign and the cause has received over the past three weeks.